Which programme/s is/are needed to gain access to FM Plural 103.9? In the event of using Real Player or WinAmp, what should I do when the WMP reproducer starts up? Is it possible to gain access to the radio station through proxy or firewall modes? How can I get connected if I am seeking a proxy mode or firewall? What happens if, in spite of the programmes being activated, no connection is achieved? Is it feasible to get in contact with trained personnel of the radio station to ask for help? It is required to install a web navigator (Explorer 6 or 7, FireFox 2 or Safari), together with an audio reproducer (RealPlayer or WinAmp). In the same window where WMP opens, the required buttons to operate Real Player or WinAmp are displayed. These two reproducers have the advantage that, if so desired, the user can close his web navigator and keep on listening to the radio station from either of the two. In general, proxies and firewalls do not allow access to simultaneous multimedia servers (streaming) as the connection mode with an online radio is different from that used to connect to an ordinary website. Although the proxy and firewall have the necessary capacity to achieve connection, it can be restricted by the administrator. The only way to enter through proxy or firewall (having the adequate capacity to achieve connection) is by setting them up. Only the administrator of the intranet of the user’s computer equipment or of the Internet connection can carry out this task. The limit to achieve simultaneous connections available in the radio station may have exceeded, in which case, new attempts should be made later. Radio personnel are not allowed to solve or diagnose technical inconveniences related to the user’s ambience nor the internet connection supplier. On our part, we ensure an adequate transmission all day long. 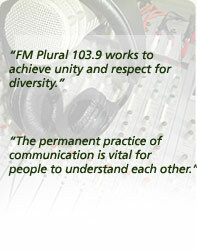 Radio FM Plural™ is a trademark . All rights reserved.